Heidi has been letting us follow along with her CalFresh Challenge – from her budgeting tactics to the struggles to make sure her five-year old daughter and two-year-old son had enough to eat. Now at the end of the CalFresh Challenge, Heidi shares what she'll remember most. When I was first thinking about this Challenge, I knew it would be hard to do with kids and I expected to fail. However, after all the generous donations I received, I felt I had to give it my best shot and see it through to the end. So I went full-in, and here we are at the end of Day 5. I was going to talk about what I could have done differently in my shopping to make it through the full week, but that is not really the point of this Challenge. The point is that it is hard to do, even under the best of circumstances, and too many people have to do it under much more challenging conditions. The CalFresh Challenge has had a greater impact on me and the people around me than I expected. The conversations with colleagues, opening of dialogues with people who have lived through hunger, and the visceral first-hand experience of just a moment of struggling with stretching our food to make it last all week. I think a profound insight from this week is how much physical and mental energy goes into thinking about food when you don’t have enough. Besides the planning, the shopping, the preparing and the cooking, there is the worry about not having enough, the strategizing about how to make it last, and what to do if it doesn’t. And when you are hungry, you are also not operating to the best of your capacity. I imagine trying to make the climb out of poverty when deprived of enough food to thrive. At least food assistance helps, but it is not enough, and it is inaccessible for many. With that, we end our journey. Thank you for your support and your encouragement. If you want to learn more or do more, please visit our website for suggestions or continue to donate to the San Diego Hunger Coalition through my fundraiser. Thank you! Diane committed to sharing her CalFresh Challenge story on her personal blog and we're excited to share her experiences with you. We heard about how she prepped for the week while on crutches, then got through Monday morning without her daily latte. She already felt the physical effects of her CalFresh diet by day two. Read on to see how she was feeling by day five. Things are getting really boring up in this here palate. It’s really hard to change up the meals enough to get interested in eating at all. I’ve had a total of twelve meals and eight of those meals have been pasta. The good news: After Day Five, I won’t have any more pasta to eat. The bad news: I will still have two days left on the Challenge. What will I do for Saturday and Sunday? I have a few options. Part of the complication is that I am planning on going to a free street music festival for all or part of both days. Between the eggs and oatmeal, I’ve got both breakfasts covered. For both dinners, I could split the chicken breast and use the $5.99 to get some produce or rice (possibly both). Instead of lunch, I could just use the watermelon and the apple to snack on while I’m at the street fair. That successfully gets me to the end of the Challenge - although that's cutting it much closer than I expected. Before her CalFresh Challenge began, Heidi shared about her experience budgeting and meal planning for herself as well as her five-year-old daughter and two-year-old son. Read on to learn how Heidi was feeling by Day Four of the CalFresh Challenge. I’m getting nervous when I look at what is left in our fridge and pantry. Despite my best efforts in planning and budget shopping, the weekend is going to be rough. I mentioned that I’ve been trying to keep things as normal as possible for the kids. It is striking how natural it has been to ration my food in order to protect my children from experiencing the effects of a limited food supply. Serving larger portions to them and setting some aside in case they are still hungry, waiting to see what they eat, and only eating more if they are done, eating their leftovers or saving them for the next day… This is what food insecure parents do on a regular basis to give their children the best chance they can at being healthy. In San Diego, 44 percent of CalFresh recipients are children. Those kids are at least receiving food assistance, as opposed to the ones in families that have incomes higher than the eligibility cutoff for CalFresh. A two-parent household with two kids has to make less than $49,000/year to qualify. In San Diego, as in many places across the country, you can make a lot more than $49,000 and still be truly struggling to make ends meet. Interested in how CalFresh helps parents provide their kids with the nutrition they need? Click here to learn more. I was actually looking forward to the CalFresh Challenge. It was a puzzle to solve. It was a way to better understand my community. It was a conversation starter. And really, I didn't think it would be that hard. I recently graduated college, so I'm not too far removed from my unpaid internship days. I know how to stretch my meal budget. Scratch that: I thought I knew how to budget. It turns out, one day of the CalFresh Challenge proved me wrong. On Sunday night, I wandered around Grocery Outlet for way too long, comparing prices and nutrition labels. Finally, I came up with these ingredients. Total cost: $3.82. I left myself some wiggle room for a snack later in the day. I figured I could stomach eggs for every meal if I cooked them differently. For breakfast, I had a fried egg sandwich. I boiled a few eggs and put them in the fridge for later in the day. At work, I had the banana and canned oranges for a snack. Lunch was cup of noodle soup. I tried not to think about how much sodium I was consuming. I just reminded myself, "This was only 33 cents." After 5 p.m., I was tired after a day of work. The cup of noodles didn't leave me feeling great. I could have finished off the eggs and bread for dinner. I could have gotten creative with the 45 cents I had left for the day. But my dad was visiting, and at that point, all I wanted was vegetables. We went out to dinner and spent something like half a week's CalFresh budget on one salad. The CalFresh Challenge was difficult. While I'm definitely not proud of my failure, it confronted me with the reality thousands of people in my community face every day. Even when I've had to stretch my budget in the past, I always had a safety net to fall back on. I have generous parents who take me to dinner when they visit. I can afford to cheat. I can't imagine the stress that food insecurity creates for my neighbors who have to carefully limit their food spending, even when life happens. After today, I'm more aware of my privilege and how much I don't know about hunger. I'm more motivated to listen with humility, to learn, and to support the San Diego Hunger Coalition's efforts to make sure no one in our community has to live without access to enough food. The CalFresh Challenge asks you to live on a food budget of $4.27 a day, the average allotment for someone on CalFresh in San Diego County. As most people have seen this week, it's more difficult than expected. After signing up for the CalFresh Challenge, Mia was confident she could make it on $4.27 a day. She registered online. She was ready. Then, one thing came up. Then another. Monday - I was in meetings all day at coffee shops. Tuesday - I had to get up at 4:30 a.m. and the extra long day made this difficult - especially without coffee. Wednesday - Overslept and didn't have time to go to the grocery store and plan out my meals. Thursday - Bike commuting a long distance for work made me super hungry. Mia's story reminds us how difficult it is for people who don't have a choice. Thousands of people in San Diego rely on CalFresh to put food on the table month after month - even when the kids get sick, or when the car breaks down, or when the work day is longer than usual. Want to learn about what's made the week feel impossible for CalFresh Challenge participants? For one participant, it was giving up a morning latte. For another, it was grocery shopping on crutches after a knee injury. Tell us your story. My meal plan changed a bit after Sunday. It includes less healthy, low calorie options and more carby, filling options. Those of you who know me well know that I don’t do well when hungry, or “hungry,” rather. I’ve never been truly hungry in my life. After my less than 1200 calorie day on Monday with no extra vegetables or salad in the budget to fill my stomach, I was hungry and thinking about food at 8 p.m.
By the time I went to bed around 10:00 p.m., I was strategizing with my husband about modifications to the meal plan because I certainly wasn’t going to feel like this for six more days. The thought of going to a food bank did cross my mind… We settled on switching out the cottage cheese and apple for a bean and cheese burrito. The tortillas I got from Vons the next morning had hydrogenated oils in them (typically a big NO for me), but it was starting to sound pretty yummy at that point. It was also raining and I was thinking about chicken noodle soup, so I switched out the rice/beans/salsa dinner for Top Ramen, chicken, and vegetables. Probably not the worst thing I could eat. It was immensely satisfying, and I didn’t go to bed hungry. I did skip my exercise though. This is fairly typical of me, but I didn’t feel I had the energy and didn’t want my feeling of fullness to wear off. The last modification was adding tzatiki sauce to my pita sandwich. It was getting a bit dry and boring after two days, so I want to spice it up. All in all, sticking to the challenge hasn’t been too challenging. I turned down a free meal on Monday and ate my sad pita sandwich instead, but it did give me a chance to tell my coworkers about the challenge. Lack of consistent access to healthy foods – remember when I gave up my salad because it was too expensive? The choice of inexpensive, calorie-dense foods over low calorie and more nutritious foods – I have already made this choice several times to stave off hunger pangs. The other myth I would like to dismiss is the thought that people on food stamps are “lazy.” I am an accountant, so I like my facts to come in numbers. Who is eligible for food stamps in California? Families with income less than 200% of the federal poverty line. In 2016, that is $48,500 for a family of four. For those of my friends who live in San Diego, you know how hard it would be to make it in San Diego on that little income with a family. How much does someone with low education and lack of skills need to work in order to make over $48,500 a year? Assuming this person makes the California minimum wage of $10 an hour, that would be 4,850 hours a year. Or 93 hours a week with no vacation. Typically (but not always), the family of four would be made up of two income earners – the husband and wife would both work full-time, which would equate to only $41,600 a year. Two working spouses raising two kids doesn’t sound lazy to me. Hopefully you found that interesting and perhaps, inspiring? If so, please consider donating to the San Diego Hunger Coalition during this week’s Challenge. I have worked with them for several years now, and they are a reputable and worthy not-for-profit. You can donate via my Crowdrise page (donations go directly to San Diego Hunger Coalition) or donate to them on their website. This week, CalFresh Challenge participants are experiencing a glimpse of the difficult realities of food insecurity. On a CalFresh budget, the simple task of grocery shopping gets complicated. It takes hours of calculating, shopping and meal prep to come up with a week's worth of nutritious and filling meals on just $4.27 a day. 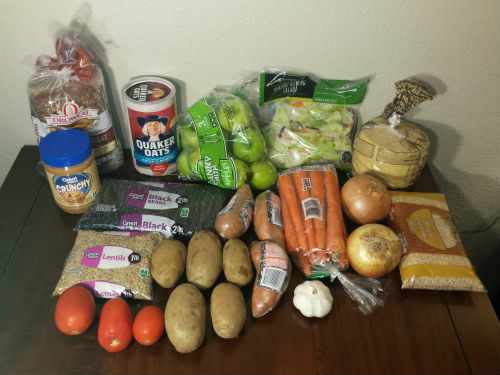 Diana took the Challenge and shared her groceries for this week, costing a total of $26.09. One of her first meals: taco night. Getting creative with ingredients, her dinner cost $1.10. If you want to learn more about walking in the shoes of families and individuals on CalFresh, it's not too late to take the CalFresh Challenge. Click here to register and learn more. In an effort to raise awareness about poverty and hunger, I will be living off the Supplemental Nutrition Assistance Program (SNAP) allotment for the next seven days. The purpose of this challenge is to raise awareness and experience what it is like trying to eat healthy on an extremely limited budget. It highlights how far reaching food insecurity can be. SNAP, formerly known as food stamps, is our nation’s largest hunger safety net offering nutrition assistance to over 45 million low-income individuals. In California, we call this federal program CalFresh. It provides 1 in 9 Californians with a means to purchase healthy foods while improving household food security. The average CalFresh benefit allotment for one individual is $4.27 per day, or $29.89 for a week. Stay tuned to see what $4.27/day looks like and why this is called a challenge. Here is a photo of my breakfast from Day 1 of the CalFresh Challenge. The banana might not look the most appetizing or freshest because I bought them last week when I was able to get to the discount grocery store. I hope this helps to highlight the difficulties individuals and families face with transportation and food deserts. In my day to day work at Feeding America San Diego, I see what the cost of hunger is on our community. I’m raising money and awareness by launching a fundraiser through the month of September for those that would like to support me and my life-long mission of alleviating hunger and empowering others. Will you help me by making a donation to help end hunger in our communities today? Thanks in advance for your support! I was soooo sleepy on my second day. Felt like I was moving and thinking through mud. It really didn’t abate at all throughout the day. The caffeine headache was right on schedule. I figure it’ll stop on Thursday. I can’t say that I woke up hungry, but I’m sure as heck consuming a lot fewer calories than usual. I keep meaning to figure out what my nutritional totals are, but I’m too sleepy to do that tonight. Let’s get to the meals. I really felt like having oatmeal this morning would only amplify my sleepiness, so I went with two hard boiled eggs. Pasta and sauce. I pulled out all the chicken to save for my dinner portion. The pasta was really good (I’ll buy that brand again), but it didn’t really fill me up and by 3:30 I was craving something to munch on. I regretted not grabbing one of my apples or cut watermelon. I was barely through the door when I made a dash for the refrigerator to heat up dinner. I had TWO whole glasses of milk and the chicken tasted wonderful mixed in with my pasta. If I could go back and re-plan my groceries, I would have skipped the eggs and only bought a half gallon of milk. That would have given me a little bit more for rice and some veggies. A few folks have asked about veggies. Part of the challenge is to try and eat as healthy a diet as you can. To be honest, that is a low bar for me, but I was up for it. Well, I was up for it until I tried to budget for them. Fresh produce is ridiculously expensive comparatively. Actually, all the cheaper foods are worse for you. Go ahead. Compare the price of a loaf of wheat bread to ramen noodles. It’s really frustrating. Our Hunger Advocacy Network Manager Diane Wilkinson is documenting the highs and lows of her CalFresh Challenge on her own blog – and we want to share her experience with you. Catch up here to read how Diane prepped for the week while on crutches. Now, she shares her day one. After the exhausting trip to the store on Sunday, I was beat and the knee was throbbing. I was done. Took some ibuprofen. Put some ice on the knee and fell asleep. No meal prep for me. As challenging as this knee can make my life, it doesn’t even compare to the challenges that those that actually utilize food assistance face every day. Plus, I don’t have kids. I’m not much of a breakfast person. Usually, I do a fancy Starbucks latte and call it a day. Yes. I spend $5.85 on a latte every day. It is a Venti 4 shot espresso skim milk latte. It’s the only caffeine I have all day. It jump starts my brain and likely my heart. The scariest thing about the challenge for me is giving up my latte every morning. Don’t get me wrong, I’ve done it before. It’s the first thing to go when I hit rough financial patches, but it is not pretty. The caffeine headache is immediate and Excedrin barely touches the pain. Plus, I’m much more muddled and clumsy. I warned my colleagues at work. I wanted them to be prepared for a caffeine free Diane. In lieu of my Starbucks, I went with two of the instant oatmeal packages. Not very exciting, but filling. Because I didn’t do any meal prep the night before, I planned to skip lunch. Not the best option, but I’ve worked through lunches before. It’s possible. Luckily, my cubicle mate Robin, brought in homemade pumpkin/squash soup that she had made for the challenge and offered to share with all of us. She had calculated the cost per serving to be $.49. I had about 2 servings for a total of $1.00. This brings the total I have available to spend to $5.99. The soup was great. I got the recipe. Who knows, maybe this challenge will kick start a cooking spree for me! Fingers crossed. Pasta. Pasta Sauce and Chicken. Glass of Milk. Simple easy and tasty. Good thing I like it. This is going to be my lunch and dinner for as long as I can stretch it. I kept the portions small to start off the week, in order to help it last longer. Turns out my portion size might have been a little small or I ate too early. I was really hungry later in the night. I decided to grab one of the apples. It was good enough to get me to bed. So that is Day one. Just one small hiccup and many people have to skip meals to make the food stretch for themselves or their family. Not too fancy. Not the healthiest, but generally healthier than my usual fare. For some of us coffee addicts, the most difficult part of the CalFresh Challenge has been the coffee headache. Or the weak second cup reused from the same coffee grounds. Jen Weck, development coordinator at San Diego Hunger Coalition, had to choose between getting her morning coffee and eating enough vegetables for dinner. I’d have more going for me if I hadn’t purchased my regular coffee this morning, but I had to be able to function today. The rice will give me volume and the eggs will give me protein, but the broccoli is most likely barely one serving. I’m going to be hungry and sad at the end of the day. I definitely won't be able to afford a glass of wine after work! This year, we're offering a new option – to take the CalFresh Challenge for just one day. But while this option is less of a time commitment, participants are learning how difficult it is to access enough food when they can't divide their grocery costs over several days. I failed! I took the Challenge for today and shopped wisely, but ended up going over budget by 52 cents. Then, I shopped for lunch and dinner. I guess if I had planned better, I could have made sure that my lunch would not be the same thing as my dinner. Think you could make it on $4.27 for a day's worth of food? Take the challenge and tell us your story. What I knew: I had to buy enough food for all my meals for seven days on a budget of $29.89. This was going to take some planning and a lot of work. My intention was to sit down on Saturday and look through all the “sale” flyers for Vons, Ralph’s, and Food 4 Less. I would make a preliminary list of items that were on sale at each and map out a plan of attack on the most efficient way to hit all the stores on Sunday. I intended to start out a Sprouts for produce comparison and then a nearby store called Smart and Final – a bulk/wholesale/discount place. This planning is important for a few reasons, first and foremost, that’s not a lot of money to stretch and I certainly didn’t want to end up short at the end of the week. I needed to think through portions and whatnot. Reason two is that I’m not really what anyone would consider a cook. When you are single and not restricted to a very limited budget with your food, you can afford to be somewhat lazy and rely on more prepared foods. I am guilty of this in a big way. You can’t do that on $4.27 a day. As the quote at the beginning of this blog alludes to, things did not go as planned. Early Saturday morning, my recurring knee problem decided to recur. My left knee dislocated while I was trying to move some furniture. After I was able to pop it back into place, I was only capable of lying on the floor for close to an hour until the pain subsided enough for me to crawl over and find my crutches in the closet. I did not plan. I put ice on my knee. Elevated. Consumed ibuprofen and laid in bed for the rest of the day sleeping. Sunday wasn’t much better. As I laid in bed, I made a new plan. I knew I would be able to walk with my brace and a crutch. This would at least allow me to go grocery shopping, but I would definitely not be able to master the bargain hunt that I originally planned out so meticulously. Instead, I had to think about ease and convenience. I ended up in an Uber to Ralph’s. This is a big cheat. If I were truly limited to the income needed to qualify for Calfresh and wasn’t fortunate enough to have a car to drive, I would have been restricted to bus travel. Let’s just keep that in mind as I finish my post. On the fly, I decided to pick up a few staples that would hit the sweet spot of simple to prepare, cheap, and plentiful portions to get me through as many days as possible without spending too much time on my feet in the store (Shopping with a crutch and a cart is difficult to say the least). 16oz package of Penne Pasta – $1.49 On Sale! 24oz jar of pasta sauce – $2.49 On Sale! 3.38 lbs of boneless/skinless chicken breast (at $1.99/lb) – $6.73 On Sale! That leaves me $6.99 to work with should other unexpected circumstances arise. I’m not comfortable with that slim of a buffer. Even with the best planning, I couldn’t have accounted for a transportation breakdown. As a result, I found myself beginning to prepare lunches for this week at 11:30 p.m. on Sunday night. I thought about how challenging it is for families who juggle competing priorities to find the time to plan, purchase and prepare. The USDA found that SNAP recipients spend at least 60 minutes more each week, planning, purchasing and preparing their food, than those who do not need or use SNAP. My guess is that 60 additional minutes is an incredibly conservative estimate. Stretching this tiny budget in a way that provides nutrition has taken a lot longer than normal, and has definitely left me wishing I had purchased even stronger coffee. The most exciting thing happened to me yesterday: I got a $5 off $10 worth of purchase at Target that can be applied to groceries. Luckily, I hadn't purchased all of my week’s food yet and still had enough money left to take advantage of this coupon. I headed straight to Target to make use of my $5 off $10. I painstakingly picked the best produce to fill me up and supplement my meals (by supplement, I mean that night’s dinner was veggie stirfry.) After putting my items on the conveyer belt, I pulled out the coupon. I stopped when I read the details: valid 10/2/16 - 10/15/16. This week’s coupon was $5 off $15. I was so embarrassed. I tried to explain to the cashier I was confused and misread the dates, asking if I could use the other coupon now. She responded by asking if I “just wanted to buy some gum or something to bring the total up to $15.” It made me realize how privileged so many of us are to be able to flippantly spend $5. I could feel my face start to warm as I said I would not like to buy the items and asked if she’d like me to put them away. I could tell she was embarrassed too, as a line had formed behind me. She said not to worry about it and I slinked away. I left the store embarrassed, deflated, and still in need of veggies for that night’s dinner. Luckily, the next store I went to had much better deals than Target, but I was only able to get there because I had a car and extra gas. What's been the hardest part of your week so far? We're halfway into the CalFresh Challenge, giving people across San Diego County a better understanding of how food insecurity affects thousands in our community. What we're hearing so far: it's more difficult than expected to feel full, healthy and energized on just $4.27 of food a day. I am taking the CalFresh Challenge to raise awareness about hunger in San Diego and to see what it is like to have a limit on the amount and types of food that I am able to eat. Today, I'm eating this small salad. It has eggs and feta cheese along with some greens and vegetables. I find the experience to be eye-opening. I didn't realize how hard it can be to get a proper amount of nutrition on the daily allowance of the CalFresh program of $4.27 a day. It's not too late to give the CalFresh Challenge a try. Click here to learn more and take the challenge. To raise awareness, share your experience with us on the blog or on social media. I'm feeling pretty good about what I was able to buy for $89.67 for a week of food for myself and my five-year-old daughter and two-year-old son. The hours that went into planning and shopping are another story. I've never meal planned or set a budget for food, so it required some serious thought and time, including going to three different stores to get the lowest prices on the food on my list. In addition, my husband is out of town this week, so I will be picking up the kids from two different places after work, and by the time we get home, I'll have about 10 minutes to get dinner on the table. Any other week I would do takeout or frozen meals most nights. But this week, we can't afford it. This week, I'm bringing awareness to the fact that over 423,000 people in San Diego County cannot get enough food to lead a healthy, active life. After extensive planning, I couldn't meet most of these requirements on such a limited budget. My original meal plan included things like peanut butter and eggs. I usually eat all-natural peanut butter and pasture-raised eggs, but someone on CalFresh would probably go for cheaper options. The peanut butter at Walmart is loaded with sugar, unhealthy oils, and preservatives, whereas the peanut butter I get from Sprouts that costs three times as much and has just “peanuts” as the ingredient. The eggs at Walmart come from chickens in terrible conditions – shoved in dark warehouses with barely any room to move around and no access to sunlight. I can’t really pretend that I am being healthy on this budget if I am using the cost of a product I would never be willing to eat. And since my peanut butter and egg choices are simply too expensive, I couldn’t fit them into the meal plan for this week. The requirement of having a protein and fruit or veggie at every meal was the next thing to go. I started out with oatmeal and eggs for breakfast. You heard what happened to the egg idea. How about oatmeal, greek yogurt, and berries? The greek yogurt I usually buy is $7.99 for 32 oz (4 servings). The yogurt alone would be more than my per meal budget of approx. $1. The berries are also too much. How about a salad with chicken on it every day? The salad mix costs about $1.20 per serving and the chicken is 75 cents per 4 oz. Another budget blown. The salad issue brings up another challenge. I am used to picking healthy, low calorie foods to maintain my weight. The salad mix has next to zero calories, but costs $1.20 per serving. I can’t afford to eat healthy foods this week that are not calorie dense. So instead of low-carb foods, I am buying bananas, brown rice, beans and sweet potatoes to get nutrition and calories at the lowest cost possible. I still didn’t quite meet my 1200 calorie requirement for each day. We’ll see how that affects my ability to exercise each day. Here at the Hunger Coalition office during the the CalFresh Challenge, we are experiencing what a struggle it is to prepare an entire day's worth of healthy food for just $4.27. Robin McNulty, our school meals program director, prepared a delicious and cost-efficient squash soup to share with the office, but she still struggled to make ends meet within the budgetary limits. Check out her story and meal plan for the first day of the Challenge. So far, the challenge has been an eye opening experience and I've had many "aha moments" in preparation for the week. Even with careful meal planning, there's a limited amount of food available. Today was rough without grabbing my usual snacks for my morning grazing. Breakfast was warm and tasty, but not filling. I found myself obsessing about food, and it wasn't even lunch time yet. It is beans and rice for dinner - and even that puts me over the day’s food budget. Click here to take the CalFresh Challenge for one day ore more this week. Click here to share your stories and photos to raise awareness on the blog. Welcome to day one of the CalFresh Challenge, an opportunity to walk in the shoes of one in eight people across San Diego County who don't have access to enough food. We're already starting to see what a struggle it is to feed ourselves for just $4.27 a day. To kick things off, San Diego Hunger Coalition's executive director Anahid Brakke is sharing what's on her plate today. After some creative meal prep last night, she figured out how to stay healthy and get a lot of bang for her buck. However, she has to sacrifice the variety she usually enjoys in her meals throughout the week. "It took lots of cooking and planning to come up with today’s menu," Anahid said. "Which will also be tomorrow’s menu. And the menu for the day after…and the day after that…"
For many San Diego families enrolled in CalFresh, a limited budget means making the same groceries last throughout the week. What's on your menu today, CalFresh Challenge participants? Email us your photos and stories to be featured on the blog this week or share on Twitter using #CalFreshChallenge. It's not too late to join the CalFresh Challenge. Click here to take the Challenge for one day or more this week.